Notes: Based on original novels by Yano Tetsu. Well, I could give you the full summary of this movie, which could take about ten or twenty pages, or I could just give you the important details. Okay, there's this kid, see (I don't even remember his name), and one day his adopted parents are brutally murdered in the little village they live in. Naturally, the villagers blame the deaths on the kid, and he takes the Dagger of Kamui (I guess it's an heirloom or something) and flees off into the night, pursued by his next-door neighbors who want to stone him. He comes into the care of a Monolithic Monk who teaches him how to ninja-fight (of course). He then is sent off to look for some great treasure. Sometime in this part of the film he finds out that he was tricked by the Monolithic Monk into killing his real father, and he runs to find the treasure on his own and eventually take revenge on the Monk who offed his father. The kid's travel is made more interesting by the fact that he gets attacked by ninjas (probably belonging to the Monolithic Monk) just about every step of the way for the first hour and a half. The kid with the Dagger travels to all sorts of places and meets all sorts of diverse, uninteresting friends and foes. Eventually, he ends up going to America (yeah) to search for Captain Kidd's lost treasure (double yeah). Along the way, you learn a lot about historical wars in Japan, America, and Europe. Yick. As you can tell from the synopsis, I didn't care much for this flick at all. Where to begin? Well, let's begin with the general specifics. The plot is LONG, dragged out, and probably could have been condensed into about half the space it took on the videotape. Not to mention the rather silly tie-in to Captain Kidd (he was really a ninja? Wow!) that tries to unify the entire film. Animation-wise, it's pretty decent, especially in those scenes where our hero is yet again inexplicably attacked by hordes of ninjas. Some of the fights are slick, exciting, and gripping...at least they are the first or second time around. After the hero yawns and gets beset by ninjas yet AGAIN, it gets kinda old. Plus, it doesn't help that just before he gets attacked, we get treated to this annoying whottawhottawhottawhottawhottawhotta sound, along with that bizarre 70's disco soundtrack (he's just staying alive, I guess). Transitions are non-existent as the movie cuts from scene to scene, often not bothering to finish the last scene before it. I mean, the kid will be just getting up from camp when the scene will cut to this panoramic view of the mountain and then BOOM the scene will cut to a shot of downpouring rain and then it SPLASH it cuts to the kid reading a scroll and WHOTTAWHOTTAWHOTTAWHOTTA the kid starts fighting ninjas and SCHLICK flashes of light emit and ZAP the kid's in another town, sitting at his bed, cleaning his dagger. Get the picture? Did I care about the characters? Well, yes and no. By about hour two or so, we were...um...rooting for the bad guys. Well, we figured that if the hero got slain, then the movie would be over, right? Unfortunately, our hero was too hardy (or just plain stupid) to die. The biggest problem (and I do mean biggest) with this anime is that it was just too darn long, with not enough interesting things happening to justify its length. The movie could probably have been reduced to about half its length without sacrificing an iota of flow (such that it was). As it was, it sorta zapped from scene to scene to scene, with no indication of when it was ever going to end. I remember us shouting at the screen, "CREDITS! COME ON, SHOW US SOME CREDITS ALREADY!!" There was quite a bit of historical stuff, though, which I guess would be a plus if you like lots of history and dates in your anime. We do, but it wasn't enough to keep us from cheering when credits finally rolled. Overall, you'd probably be best off not seeing this one. You want ninja action? Go rent Ninja Scroll instead. But, do you like Japanese and European colonial history? I mean, REALLY like history? I mean, like it so much you'd be willing to lose an appendage or two to learn more about it? 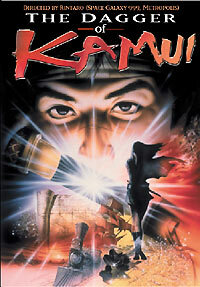 Then, you might like Dagger of Kamui.